Becoming an intruder into somebody else's moment, sneaking into that magic instant that is no more and freezing it for posterity is one of the most thrilling experiences at least for me and I guess for anyone that enjoys photography. 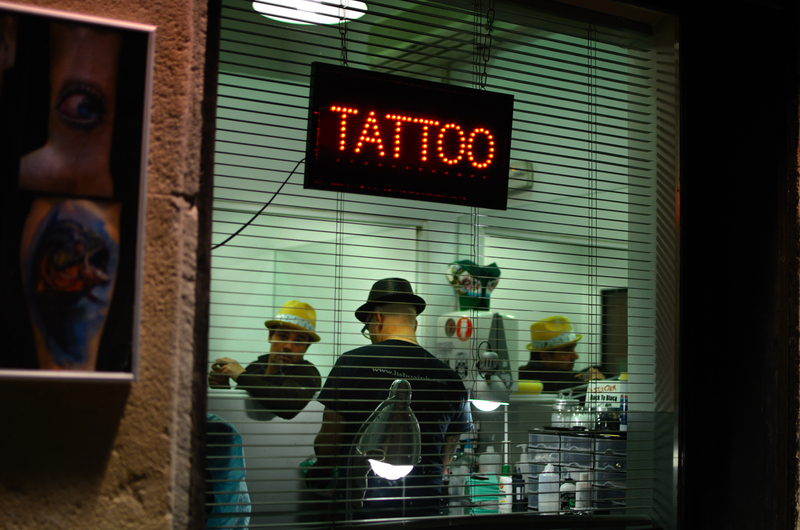 Walking down the narrow alleys of Barri Gotic, in a street whose name I can't recall, there was this small tattoo shop. The reflection of the man on the mirror and that green pouring out of the blinds really grabbed my attention. I had serious doubts as to whether to use black and white here and I can tell you it looks great but if color made me capture the scene in color it will go.